Emeline, comfortable and stylish, celebrates the unpredictable and unexpected adventures of working simultaneously with two skeins of Noro Silk Garden Lite. The pattern, inspired by 18th Century ironwork, is interesting to knit and satisfying to wear. 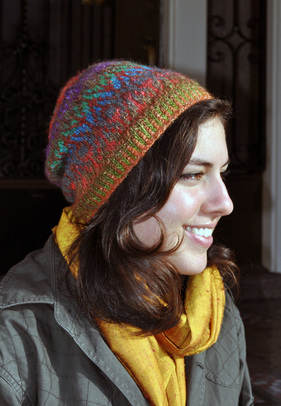 As a compliment to the rigid structure of the chart, gentle color changes within the yarn guarantee a unique hat. This pattern requires intermediate knitting knowledge including: working in the round, two-color ribbing, reading charts, simple stranded color work and decreasing, all on double point needles. 26 sts and 26 rounds = 4"